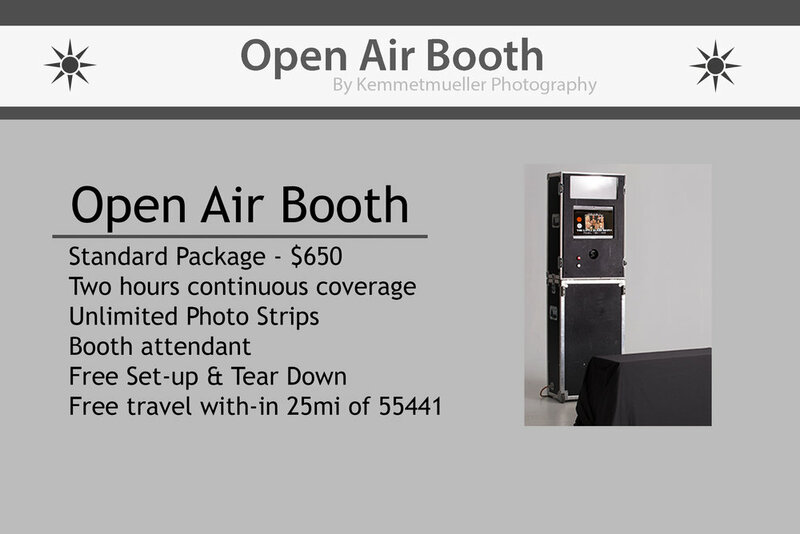 Info — Kemmetmueller Photography Inc.
What's so unique about our Open Air photo Booth? Our photo booth is the perfect way for your friends and guests to express themselves. The Open Air Photo Booth has no curtains, so there's plenty of room for lots of people - and no set dimensions! Choose any background of your choice; even an outdoor location! Our featured printers are of the highest quality and use the best paper and ink to give your photo strips that extra shine. Instead of common inkjet printers that fade over time, we use a sub-dye printer so your prints last a lifetime. Unlike other photo booths, you can easily switch between color and black & white. Each trip to the photo booth is unique and different! Call to get custom package options! Such as Longer hours or custom design photo strips!